Formed in Tradition. Trained in Compassion. Prepared to Shepherd. Our mission at Mundelein is simply stated but profoundly engaging: we form parish priests who are prepared and excited to bring others to Christ. In the words of the Second Vatican Council, a seminary should function as the heart of the diocese it serves. It provides a bridge between the individual parishes, led by their parish priests, and the entire diocesan community, led by its bishop. Furthermore, a diocesan priest himself should serve as a bridge between his people and the Lord, helping them to enrich their own spiritual journeys. 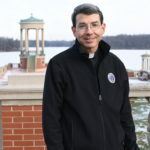 This triad of “heart,” “bridge,” and “parish priest” beautifully captures both the reason that Mundelein Seminary exists and the mission the Holy Spirit impels us to pursue. Mundelein is home to nearly 200 seminarians from 34 dioceses from across the country and around the world. But what they all have in common is that they are preparing to serve a specific community that is centered on a local Church in obedience to their bishop. In other words, every man at Mundelein Seminary has a heart that is burning to serve as a parish priest. But the modern Church is dynamically changing. The parish of today can be vastly different from that of a generation or even a decade ago. As smaller parishes are consolidated into single parishes of much larger extent, as social media becomes increasingly more pervasive, as more and more Catholics are raised without basic catechesis, and as the pressures of a secular culture multiply moral challenges, a parish priest needs to be a man who is intellectually well-grounded in the Truth. He must be socially capable of not only sending a tweet but also personally interacting with people from all walks of life and in every conceivable pastoral situation. Above all, he must be a man of deep interior prayer. At Mundelein, our academic and formation teams integrate their missions into a common goal of forming priests with precisely these qualities. As you discern your own vocation, continually ask the Holy Spirit for guidance and do please keep us at Mundelein Seminary in your prayers. The seminarians, priests and dedicated lay women and men you encounter in these pages are all driven by a single mission. We are Mundelein Seminary. We form parish priests.